Food Revolution Day is May 15, 2015, it was started by Jamie Oliver a few years ago, following in the spirit of his Food Revolution cookbook, which I have and use often. I highly recommend it as it is a great book. It is all about making your own, good, healthy real food. Making your own food doesn’t have to be complicated, some of the best meals are very simple. This recipe is one of those. I found the original recipe in a magazine and have tweaked it to be quicker and easier, but it is healthy and full of flavour. 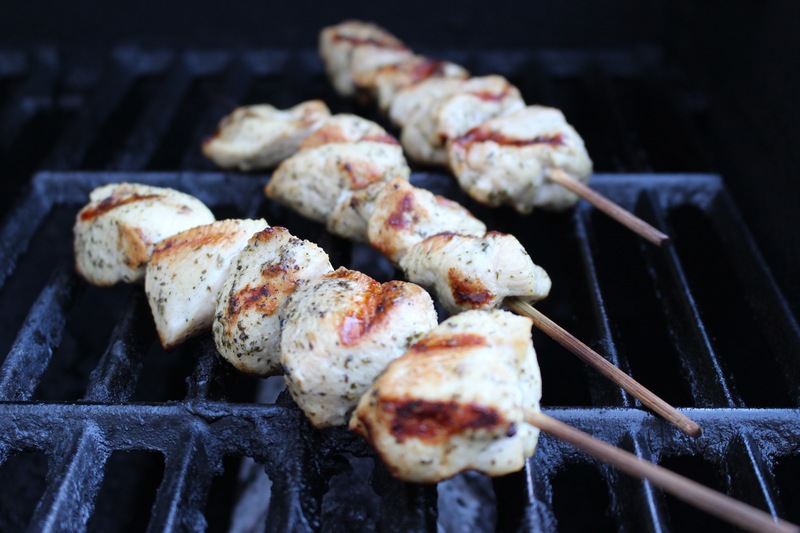 This is a great summer recipe, very tasty and perfect on the grill, but good in the oven too. Especially nice because you can throw everything in a zip top back to marinade all day and then grill in the evening. I will spare you the photos of cutting up raw chicken. The chicken should be cut in chunks big enough to be threaded onto a bamboo skewer, maybe an inch or two. 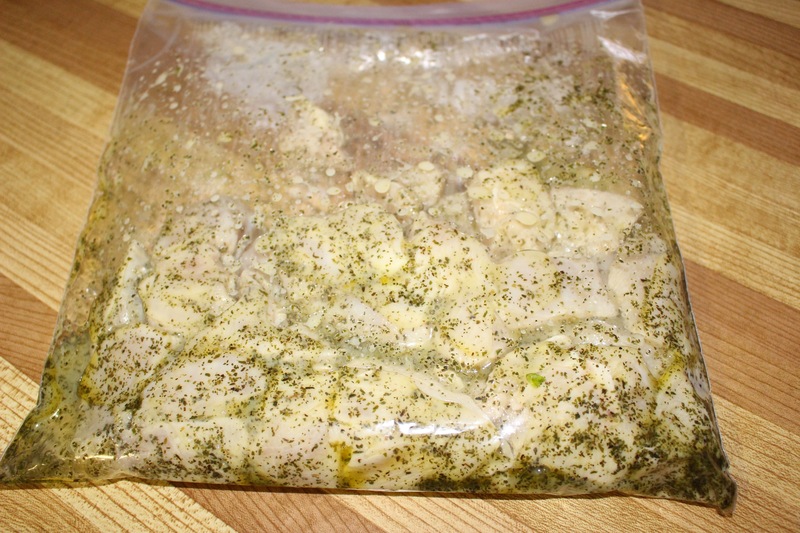 Place chicken in a zip top bag along with 1/4 cup lemon juice, 2tbsp olive oil, 2 tsp minced garlic, 1&1/2 tsp dried oregano, and 1/2 tsp salt. Shake around to coat chicken and place in refrigerator all day (or at least a an hour). Thread onto bamboo skewers that have been pre-soaked in water for a couple of hours (so they don’t catch fire), or you can use metal skewers if you have them. Grill until cooked through. 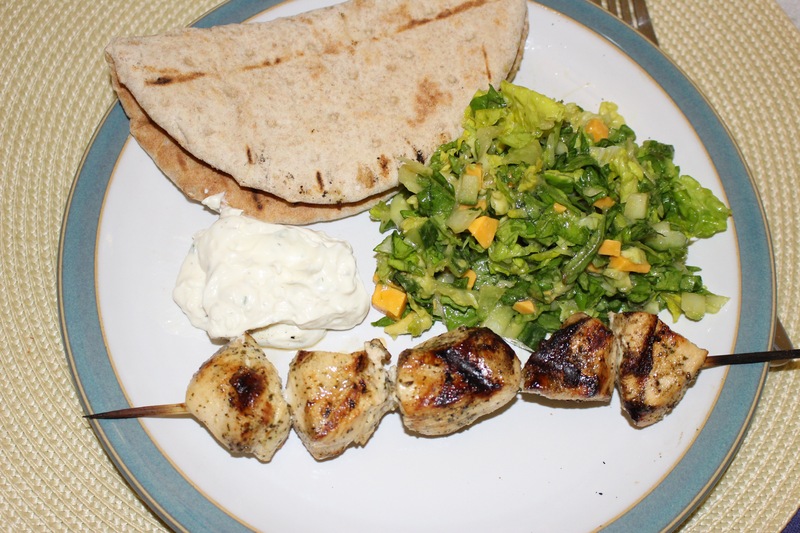 These skewers are good served with greek pita that has been warmed on the grill , tzatziki (i know that is spelled wrong) and a nice salad. We made Jamie Oliver’s chopped salad from his Food Revolution book, it is really good. This entry was posted in cooking and tagged chicken, Food Revolution Day, garlic, grill, Jamie Oliver, lemon, olive oil, oregano, skewer. These chicken skewers look wonderful. I will need to give them a try.